So Elena is a smart cookie. She's figured out not everything is on the up and up with Stefan...normal people don't usually live for that many years without aging. So she confronts him. And she says, "I know what you are." And he says, "Say it." JUST KIDDING! He tells her he's a vampire and like a smart girl she runs!!! And he follows...sort of in a vampirey way. He says he won't hurt her, but she's not really listening. Damon is off drinking all sorts of human blood but there's one human he wants to have a little fun with...Vicki. But he has a little problem...Stefan still has his super magical ring that protects him from the evil sun. So he asks for the ring, but Stefan's trying to hold on to what little power he has. Elena goes off with Stefan and agrees to give him a day to explain things. He shares the history of Katherine...a beautiful and manipulative woman who played with hearts of our two favorite vampire boys. Was it not wonderful to see Stefan and Damon actually....friends? The town is getting suspicious that there are vamps back in town and we know that's not going to mean good things. Damon has allowed Vicki to drink his blood but she's not yet a vampire. So he kills her...which gives her the opportunity to either drink blood and become a full vampire or...die. Unfortunately, Stefan tries to warn her about what's to come and in the process a member of the town...who is hunting the vampires shoots Stefan with a wooden bullet. Damon comes to the rescue in blazing hotness and rips the bullet out of Stefan's chest killing the guy who was trying to kill Stefan. But leaving enough blood for Vicki to drink....and her choice is made. And so is Elena's...she calls things off with Stefan. Great episode..the show is really developing its mythology and most importantly I'm continuing to enjoy my vampire brothers. Your thoughts? If you recapped the show as well, leave your link in comments! He also said, "I've been 17 for 150 [? can't remember the actual number] years." Totally reminiscent of Twilight. I really liked the historical flashbacks. And Katherine is awesome! But I'm getting a little tired of Elena being like, we should be together, I can't deal with you, wish wash wish wash. Just commit to the relationship, already! I really like this show, but I have never read the books yet. I have them but decided to wait to read them. I loved last night's episode. I think I'm actually glad I have never read the books; it's very unusual for me to watch the show before reading, so I'm interested to see how my reading (at least after season one) goes. Last night's show was awesome! I've never read the books but I probably will now. I'm totally hooked now and can't wait until THursday night TV! This was the best episode of the series by far. There was lots of intrigue and definitely some serious action. I figured that at some point someone would have to become a vampire and it was always between the blonde girl (who seemed a bit too obvious of a choice) and Vicki (also an obvious choice given her circumstances and characterization but maybe a bit less so). Anywhoooo I also enjoyed the flash back to the past and learning a bit more about Katherine. I hope we get to see a bit more of that in upcoming episodes. I'm glad the action started to pick up because I was worried for the first few episodes that I wouldn't be able to really get into the show long term. I think Damon has the best one liners... omg he has me rolling with some of the things he says, add in his facial expressions and I am sold. 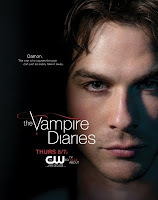 Almost makes me what to be Team Damon, but I am loyal to Stefan!! I just finished book one ( and two) and it is fun to see how different the show is from the book! Because of your excitement over this show (and the book) I decided to watch Season One, Episode One on the internet. Needless to say, I watched ALL of the past episodes and am now all caught up! I'm loving this show. Damen is that cool, wise-cracking, let's-stir-up-some-trouble-for-the-fun-of-watching-you-squirm, vampire -- reminds me a bit of Spike from BTVS.